Click here to purchase your e-book now! 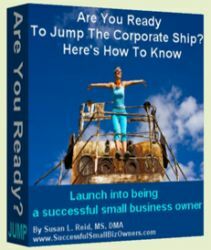 This e-Book is written for anyone working in the corporate world, who is considering jumping the corporate ship. Also for those working in the Ivory Tower of academia or in big business or large non-profits. This e-Book will help you make plans for success. If you are currently working in the corporate world and wondering what your future holds, this e-book is for you. If you are seeing the corporate writing on the wall and know your days are numbered, this e-book is for you. If you can hear yourself saying, “There’s just got to be more to life than this!” this e-book is for you. This e-Book will help you in overcoming your fears. I know what it's like to jump the corporate ship. I jumped the academia ship in June 2004. And when I did, my life turned upside down and inside out. I know what an utter and complete shock it is to leave a traditional, familiar workplace. I know about the confusion and panic that such a bold move makes. I know the incredible freedom and exuberance that follows when you do. Are you tired of living paycheck to paycheck, anxious about an unknown future? Is getting up in the morning a monumental chore? Are you tired of bringing work home on weekends and staying late at work during the week to finish-up projects? Loving what you do and for whom you are working is a wonderful feeling. Waking up in the morning, excited to start the day, with a skip in your step and a smile on your face is a sustainable pleasure many of us would like to experience. Having a satisfying and fulfilling job that we love can be one of the most rewarding experiences of our lives. Having a job that brings us the income we want, gives us an exciting avenue for creative expression, and grows and expands over time to fit our wants and needs, for most of us, sounds like a dream. When you take into consideration that most people spend more time at work than in any other area of their lives, wouldn’t it be great if we actually liked what we did, found great satisfaction in what we were doing, and felt successful and happy all at the same time? Unfortunately, for most people, this is not the case. You see, for many us, how well we do at making a living, paying our bills, and saving money, are directly tied to how successful we perceive ourselves to be. Success, then, is unequivocally tied to how we feel about what we have and what we do. Said another way: with this kind of thinking, success is directly linked to having a good job and making lots of money. If we are bringing in big bucks, have lots of money in the bank, and can easily pay our bills, then we feel successful. If we are barely squeaking by, living paycheck to paycheck, and transferring balances between credit cards while going further into debt, then we don’t feel so good about ourselves. Though, if we are making lots of money, own our own home, a car or two, vacation in the islands during the summer and ski Aspen during the winter, we feel very good about ourselves and are the envy of our neighbors. Therefore, our success is dependent upon on how much money we have, how many possessions we’ve collected, and what type of lifestyle we live. This way of thinking means that our number one priority must be our job, since without it we are nothing. The problem with this way of thinking is that we are living in a constant state of fear and anxiety. Fear that we will lose our job and anxiety about company downsizing. Pressure to always have to excel for fear that someone younger than us will steal our promotion. Anxiety over whether or not we will have a falling out with our boss, whether or not we will get fired, and that we will never be able to find another job at the salary we are presently earning. Perhaps the greatest fear of all is that politically, something will happen that will irrevocably put us on the outside of the corporate inner circle, with no way of ever getting back in. Okay, let’s take a moment to ask: Does this sound like you? If so, the time has come for you to start making the life you're ready to have! This e-book is jam packed with stimulating questions and ideas for success. After reading, you'll know, for sure, if it's time for you to jump ship. Click here to add this item to your cart. p.s. Still sitting on the fence? Well check out these babies! All are FREE and are all fun! the last is the audio companion to this e-book. Take one, take them all. It's our way of saying thank you. Click here to add this item to your cart! Do you know of someone else who is either thinking about or getting ready to jump the corporate ship? If so, you can easily send them to this page by filling in the information below. *Validation numbers keep spam robots from using this form. Thank you!